Oat flakes gluten free* 74%, sultanas* 9% (sultanas* 99,5%, sunflower oil*), cranberries dried and sugared* 7% (cranberries* 60%, whole cane sugar* 39%, sunflower oil*), sweet cherries* 4%, dried apple cubes* 4%, sunflower seeds* 2%, cornflower blossoms* 0,1%. Can be eaten cold or even warm! Cold: Best enjoyed with milk, natural yoghurt or plant based alternatives from almonds, coconut, oats or rice. Feel free to add extra fresh fruit if you wish, and eat straight away to enjoy at it's very best! 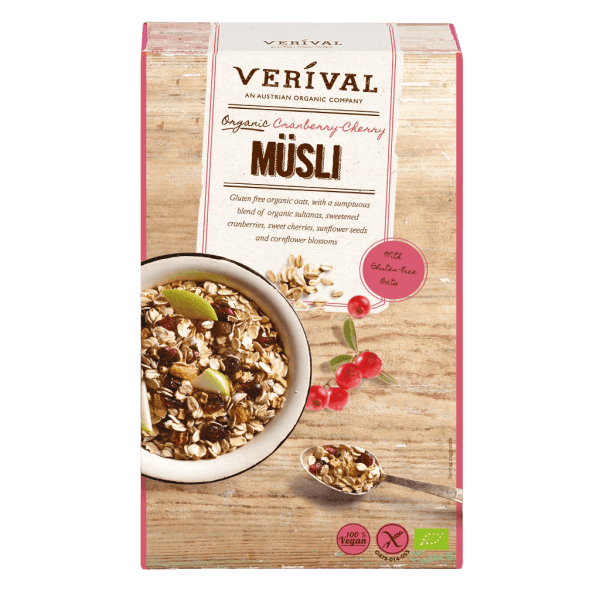 Warm: Bring milk to boil, stir in your Müsli and let it stand for a few minutes to cool, before eating.